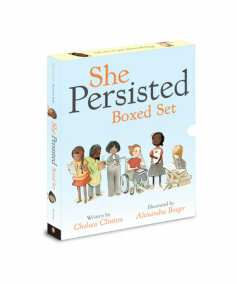 The companion to Chelsea Clinton & Alexandra Boiger’s #1 New York Times bestseller, She Persisted. 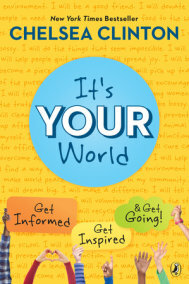 Perfect for tiny activists, mini feminists and little kids who are ready to take on the world. Women around the world have long dreamed big, even when they’ve been told their dreams didn’t matter. They’ve spoken out, risen up and fought for what’s right, even when they’ve been told to be quiet. Whether in science, the arts, sports or activism, women and girls throughout history have been determined to break barriers and change the status quo. They haven’t let anyone get in their way and have helped us better understand our world and what’s possible. In this companion book to She Persisted: 13 American Women Who Changed the World, Chelsea Clinton introduces readers to a group of thirteen incredible women who have shaped history all across the globe. 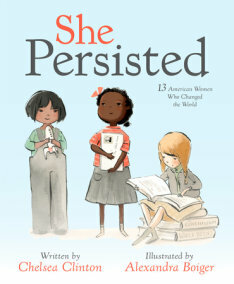 She Persisted Around the World is a book for everyone who has ever aimed high and been told to step down, for everyone who has ever raised their voice and been told to quiet down, and for everyone who has ever felt small, unimportant or unworthy. 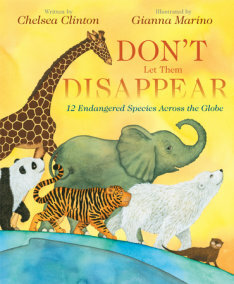 Alexandra Boiger’s vibrant artwork accompanies this inspiring text that shows readers of all ages that, no matter what obstacles come their way, they have the power to persist and succeed. 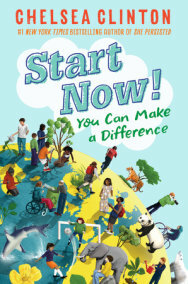 This book features: Marie Curie, Sor Juana Ines de la Cruz, Viola Desmond, Sissi Lima do Amor, Leymah Gbowee, Caroline Herschel, Wangari Maathai, Aisha Rateb, J.K. Rowling, Kate Sheppard, Yuan Yuan Tan, Mary Verghese and Malala Yousafzai.